I can't imagine what a difficult job that must have been. I look forward to reading Requiem. What an honor to have been chosen for the panel, and what a task! I had blogged about this volume http://tmsteach.blogspot.com/search?q=terezin a while back - so powerful. This award was well deserved! 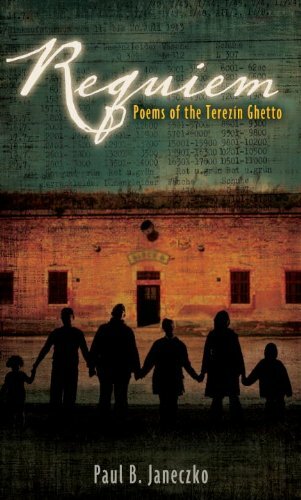 It is a lovely addition to Holocaust literature. When I've studied this in class, it was good to have many kinds of stories to share with students, and I can see this as one more poignant way that the stories are captured. Thank you for also sharing the process by which the committee chose-interesting. I'm so anxious to see this book. I know how difficult it is to pick a winner. Thanks to you and the other Final Round Judges as well as the First Round Panelists for all your time and hard work. Thanks for this post! I followed along with the Cybils this year, mainly in the picture book fiction and non-ficiton categories. One of the most interesting things for me was to think about what makes a book "award-worthy" vs. just being a book I like. I love hearing about your experience as a judge. Thanks everyone. I think it is important to know how a group goes about its work. Every one is different. And every person within the group views the same piece of work in an entirely different manner. That's what makes life so interesting! Thanks for bringing our process out into public. It was an honor to work with you! Thanks Mary Lee, it was great working with you, too, and all the rest of judges. Wasn't that an interesting exercise! As a first round panelist, I loved hearing how the second round panel worked together to arrive at this excellent choice. Thank you for sharing your process with us. Judging is scary! Happy PF weekend! a.
I'm adding this one to my wish list. Thank you for explaining how you evaluated the books. It was so nice to get a glimpse of the process for judging this category. Thanks for letting us in!